In order to provide tablet kiosk security solutions for a wider range of tablet devices, such as the Galaxy Tab, Nexus 7 and Windows Surface tablet, ArmorActive announces the launch of their newest division TabletEnclosures.com. With the release of Google’s Nexus 7, and the growing excitement surrounding the soon-to-be-released Windows Surface tablet, TabletEnclosures.com hits the market at the right time. Recently, ArmorActive Inc., a Utah tablet security solutions company, added TabletEnclosures.com, an all encompassing tablet security division, to their growing list of companies. This announcement follows hot on the heels of Google’s Nexus 7 tablet release, as well as ArmorActive’s latest product, the Full Metal Swap enclosure, engineered to secure a variety of Android tablet devices in a single product. “With the release of Google’s Nexus 7, and the growing excitement surrounding the soon-to-be-released Windows Surface tablet, TabletEnclosures.com hits the market at the right time,” says Nick Ames, CMO at ArmorActive. TabletEnclosures.com isn’t the first member of ArmorActive’s extended family of tablet kiosk security sulutions. With the success of their flagship division and accompanying website, iPadEnclosures.com, ArmorActive has already established themselves as the global leader in secure iPad kiosks. 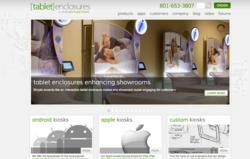 TabletEnclosures.com will help ArmorActive remain the industry leader in security for all types of tablets. Customers who visit TabletEnclosures.com can expect to find a comprehensive list of ArmorActive products, from Windows (coming soon) and Android-based solutions down to a full line of enclosures made for every version of the iPad. Their most recent Android-based enclosure, the Full Metal Swap, was actually fashioned after ArmorActive’s hottest iPad-based enclosure, the Full Metal Jacket, and has already become a huge hit with Android users. With fitted inserts of different sizes, the Full Metal Swap is a secure key locking system that has the ability to enclose several different models of android tablets including the Asus EEE, Asus EEE Prime, Acer Iconia A200, Acer Iconia A500 and Acer iConia W500. With thousands of ways to securely implement all types of tablets to improve their marketing, day-to-day efficiency and customer interaction, this latest announcement, paired with ArmorActive’s ever growing line of tablet security solutions, has given businesses more options and freedoms than ever before. ArmorActive is a Sandy, Utah based tablet security solutions company. Unique in the industry, ArmorActive provides a team of Solutions Architects to help customers make the best decisions at all stages of their tablet based projects, from procurement to implementation.